Featuring 3 bedroom in one gate community, 3 bathrooms, 3 families rooms, one Jacuzzi, 1 swimming pool, kitchen, parking area in the 1st class level. Sosua provide the greatest vacation villa rental for domestic and international travelers. Holiday 2015, Sosua villa for rent is the greatest options to choice for perfectionist vacation set in 3 in 1 gate community 10-15 minutes from beautiful Sosua beach. Featuring 3 bedroom in one gate community, 3 bathrooms, 3 families rooms, one Jacuzzi, 1 swimming pool, kitchen, parking area in the 1st class level. The living room is the most comfortable area with beautiful and clean furnitures completed with large flat TV and home theater audio stereo. The furniture is very attractive and clean for healthy activities. Painting with white long curtain, white and red L sofa that make owners feel tropical taste feeling. The rooms are perfect spot for families, friendly guests that allow guests to explore the room enjoyable. Bedroom. The rooms are comfort sleeping spot for 2 adult peoples with red bed and bed cover that impress your honeymoon adventures. The rooms are good for excellent sexual adventures with clean simply indoor bathroom, bath showcase, bath mirror, showering and high quality towels. Balcony area. The area is excellent to feel taste green Sosua landscape with simple and clean garden, lawn and private parking area. Sosua villa offers the greatest amenities facilities such as; free internet access, maid service, security and gardening. Outside pool. It is great swimming pool for relaxation and sun bathing. Connecting with families rooms, the pool become center point for all users/guests with green opening garden and BBQ area. The area always say lets enjoy your paradise adventure in Sosua. Other interior facilities. Sosua villa rental is perfect place to stay for individual and group of tourist. Offering great space living rooms and green extensive patio garden. 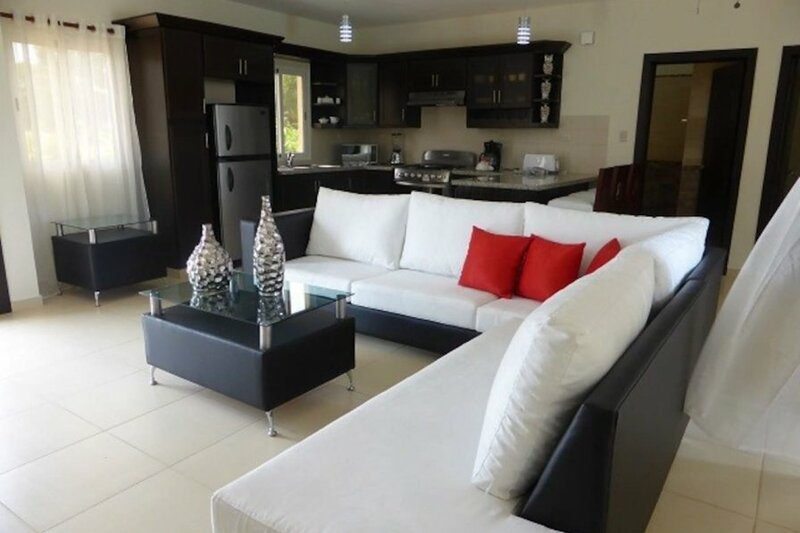 Completing with large screen flat Television, refrigerator, Wi-Fi access, internet access, pool cleaning, air conditioning system, patio, microwave, stove and maid service make Sosua villa is the perfect place to hire during vacation in Dominican Republic.